Repio - Digital Wander, Inc.
Repio is a new website link management service that lets you create a profile page with all links on the Internet that are related or important to you. With the importance of your digital foot print growing every day, get an edge on standing out from a sea of information… because identity matters! 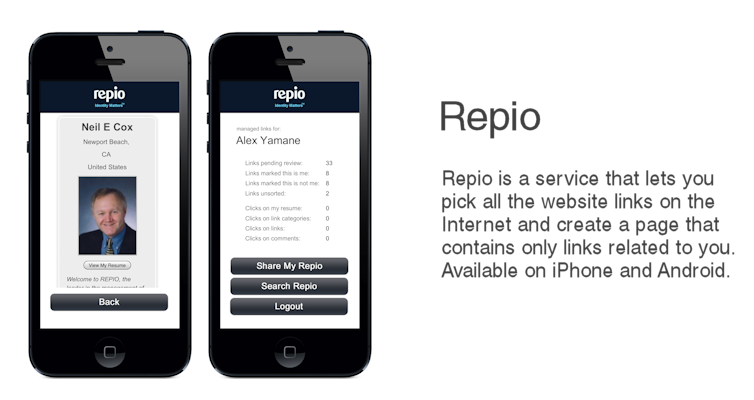 Create your Repio account at http://www.repio.com to log into the app. This entry was posted in Android, iPhone/iPad, Provisional Patent Draft and Filing by digitalwander. Bookmark the permalink.